Tourism is big business throughout the world today, with many countries relying on it for their annual revenue. International companies, Insight, Trafalgar, Club Med, the Captain’s Table, organise large affluent leisure groups pursuing historical, cultural, and mercantile interests in comfort. While air travel has all but superseded serious movement by sea, vast fleets of cruise ships ply the world oceans carrying hordes of relaxing sightseers. Grey haired retirees methodically tick off the countries and ‘sights’ they have ‘done’. A phenomenon of world affluence since the 1960s, such tourism is not entirely new. The Napoleonic Wars, 1792-1815, checked the aristocrat’s Grand Tour in his own carriage. After 1815 the new middle classes could travel by the new diligence, or public stagecoach, and later by rail. Conducted tours were offered as ‘the era of mass travel had begun in earnest.’ Karl Baedeker in Germany and John Murray pioneered new guide books in the 1830s. Baedeker sought to stand independent travellers on their own feet without reliance on hired servants, guides, coachmen, and hotel keepers. An unlikely mid-nineteenth century tourist was William Smith O’Brien (1803-1864). An Irish nationalist, transported to Van Diemen’s Land (Tasmania) after attempting an unsuccessful Rising against British rule in 1848, O’Brien has himself become a tourist attraction. His cottages at the former Tasmanian convict settlements of Maria Island and Port Arthur are mini-museums. At O’Connell Street, central Dublin, O’Brien stands in a line of celebrated statues, Daniel O’Connell, Charles Stewart Parnell, Fr Mathew, the temperance reformer, and James Larkin, the trade union pioneer. Celebrated as an Irish patriot and Westminster MP, O’Brien was even more remarkable as a world traveller. The second son of an Irish baronet, O’Brien missed the aristocratic Grand Tour, but soon after his marriage in 1833 he travelled through the Pyrenees and Alps with his wife Lucy and sister Grace. They bought a carriage in Bordeaux and sold it in Paris at the end of their journey. Ten years later, as a member of the British House of Commons, O’Brien at his own expense undertook an extensive fact finding tour of Belgium and Northern Germany, using newly established rail networks. In 1849 O’Brien’s interest in foreign travel was boosted on his transportation for High Treason to Van Diemen’s Land. Confined with three revolutionary colleagues on a naval brig, The Swift, the Irish prisoners were treated as gentlemen, with virtual saloon accommodation at the British Government’s expense. Accepting a ticket of leave after a year of close confinement, O’Brien, managed some touring in Van Diemen’s Land, recorded in his regular journal. He climbed several mountains, described the people and scenery in enthusiastic detail, but found little of historical interest. Granted a conditional pardon, which allowed him to live anywhere but the United Kingdom, then including Ireland, O’Brien found his own way back to Europe via India, Egypt and Malta. After some time with his family at Brussels, he made an extensive tour of France, Italy and Greece, accompanied by his son Edward. A free pardon then enabled him to return to Ireland. Regarded by the Irish at home and abroad as the ultimate hero who had suffered for his country, O’Brien in 1859 undertook a comprehensive excursion to the United States and Canada. He aroused passionate Irish-American enthusiasm and met leading politicians, headed by the President, James Buchanan. The following year, 1860, again accompanied by his son Edward, O’Brien toured France, Spain and Portugal. Shocked in 1861 by the death of his wife and the transference of his Limerick estate to Edward, O’Brien found solace in travel through France, Austria, Hungary, North Italy, and Switzerland. The following year his last expedition took him to France, Italy (where he had an audience with the Pope), Greece, Turkey, Rumania, Austria, Poland, Lithuania and Germany. Beginning another tour in June 1864, O’Brien died suddenly in Wales. Ostensible motives for O’Brien’s travel varied. Before his free pardon he sought a permanent residence in Europe in case he was refused re-entry to the UK. His visit to North America was intended to monitor Irish communities. Local study was his reason for visiting Spain. From 1861 to 1863 O’Brien travelled, according to his own account, to blunt the misery of his wife’s death and the loss of his estate. But basically O’Brien was congenitally restless with a passion for movement and novelties to describe. As he admitted, his querulousness at home became amiability abroad. Often portrayed as aloof, haughty and unbending, O’Brien the traveller was very different. He demonstrated a genius for making valuable contacts who provided introductions to others. Sometimes O’Brien chose second class by rail to meet more outgoing fellow passengers. He ridiculed the typically aloof Englishman, silent till formally introduced. Visiting Hungary in 1861, a chance meeting, on the Danube ferry with two patriotic Hungarians, won access to some of the most influential men in the country. Similar examples occurred elsewhere. O’Brien worked hard on his languages. Educated for a time in France, he spoke French well, had some German, struggled with Spanish, and on occasion used the Latin he had acquired at Cambridge as a lingua franca. To learn the local language, O’Brien recommended attendance at the theatre where the narrative and gestures helped to teach common phrases. O’Brien used phrases that established his own tourist credentials. Just like many today, he talked facetiously of ‘doing’ the ‘sights’. At Cadiz in 1854 he was critical of ‘those who visit only to see sights’. At Madrid and later Paris, though he claimed to find the practice tiresome, he viewed the ‘sights’ of the city. In Florence (1855) he was ‘busily engaged’ in sightseeing. 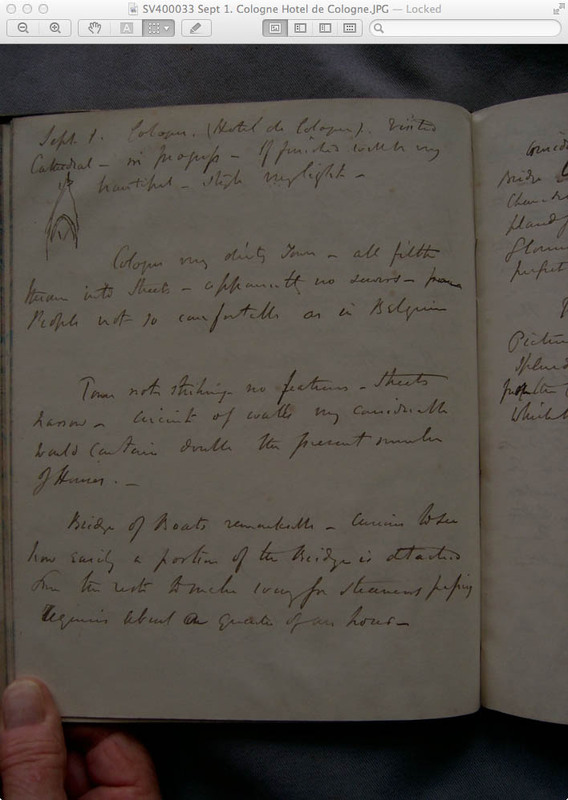 Moving on to Rome he listed places he had visited, plus ‘a multitude of other sights.’ On a second visit to Rome in 1862, O’Brien claimed that as he had ‘done’ the main tourist attractions in 1855, he was not interested in repeating them, but repeat them he did. In Rome, as elsewhere, O’Brien refused to act as a guide book for his readers. Although never citing them by name, but clearly aware of Baedeker and Murray, O’Brien preferred to record his own impressions. Thus on visiting Alexandria he considered Cleopatra’s Needle too insignificant. At Cordoba in Spain he complained that the celebrated Moorish columns lacked grandeur. Even Florentine architecture, with some exceptions, did not meet his lofty standards. Rome’s narrow streets, dirt and smells repelled him, but the interior of St Peter’s did not disappoint. Despite its authoritarian government, Naples with its balmy weather, unrivalled scenic beauty, splendid public buildings and historical interest, justified its reputation. At Granada he happily accepted that the fame of the Alhambra was merited, but at Istanbul San Sophia’s interior ‘scarcely realised my expectations.’ In India, O’Brien admired the ‘skill and perseverance in sculpture’ of the Temple images, but found them ‘utterly wanting in taste or beauty’. O’Brien frequently argued that the works of Nature, as depicted by the local scenery, were of far greater beauty than the works of man. But when enjoying a trip down the Rhine he insisted that the scenery though attractive was ‘rather tame’ compared to that of the Pyrenees, the Alps, or even the River Derwent in Tasmania. He was prepared to challenge paintings by artists of the calibre of Leonardo da Vinci, Raphael or Dürer. Only art firmly based on Nature satisfied O’Brien as truly beautiful. Like many modern tourists, O’Brien knew what he liked. He did not ‘profess for painting or sculpture that unreserved enthusiasm which connoisseurs affect yet I hope I know how to appreciate whatever is in itself intrinsically beautiful.’ O’Brien’s opinions were certainly debatable, but they were his own. While Baedeker starred places of interest and splendid views, thus enabling the traveller to avoid unscrupulous or ignorant guides, O’Brien’s experience was ambiguous. To reach Naples from Rome in early 1856 he hired a vettura, or private coach, instead of travelling by public diligence. The vetturino contracted to find clean accommodation and locate good views on the three-day journey. This was very satisfactorily achieved. A few weeks later when O’Brien decided to ride on horseback with his son Edward through unrefined Northern Greece he engaged an agaghiete. The latter rode his own horse, led them to the best water springs and found private accommodation in the villages they passed. The system worked well. On a similar excursion to the Peloponnese O’Brien engaged the same agaghiete and the same horses. Often friends or local contacts acted as guides. At Athens, for example, O’Brien was shown over the Parthenon by the British Resident, Sir Thomas Wyse, a former colleague in the House of Commons. In Hungary, a leading member of the Diet, Count Csáky acted as O’Brien’s host. Guide books could not emulate such attention, beyond the reach of ordinary travellers. On the other hand, at Pompeii, O’Brien was annoyed at the government insistence that visitors should be attended by official managers. This apparently meant touring in a party. O’Brien was distressed ‘by finding in every corner a party of tourists. . . . I cannot thoroughly enjoy a scene of this kind unless I am alone.’ As literary critic Edward Mendelson argued, aristocratic travellers of the 18th century ‘pursued exotic experience as a means toward more intense self-awareness’. In 1856, especially as the guest of a local worthy, a traveller might meditate in peace at a famous historical site, but there are few such opportunities today. Karl Baedeker stressed the practicalities of accommodation and travel routes for his self-organised tourist. O’Brien never cited particular guide books but his persistent refusal to compete with them in his journals suggests that they were close to hand. He may sometimes have taken their advice on hotels, but often improvised. His accommodation ranged from sleeping on the floor of a demarch’s (mayor) house in northern Greece to the Paris Grand Hotel with a superior bedroom costing as much as 6 francs a night. In the latter, finding dinner at the hotel cost 8 francs, O’Brien reduced expenses by eschewing the Grand’s semi-circular dining room resplendent in gilding and glass. He ate for a mere 3 francs at the Palais Royal. Modern tourists use similar tactics. With fading eyesight in 1862, O’Brien found he could not read in his dimly lit hotel bedroom in Grenoble. As hotels lacked reception rooms, O’Brien was compelled to join the classless café culture where, in splendidly decorated rooms, citizens enjoyed newspapers, cards and coffee at 2d a cup. As the brother of a peer, and educated at Harrow and Trinity College, Cambridge, O’Brien was quick to denounce inadequate tourist accommodation. In 1856 he rejected the Greek system of khans, empty buildings where travellers with a troop of horses could set up their own beds, tables and other necessities. Rather than sleep in the filthy, smelly and insect ridden khans, O’Brien was prepared to ‘rough it’ in the open air. On the outskirts of Cracow in 1861 he had to ‘stop at a miserable tavern which is kept by a Jew.’ Compelled by inadequate beds to sleep on clean straw covered with a clean sheet on the floor, William ‘never slept better’ and admitted that the 1s for lodging and a supper of milk, coffee and eggs was very reasonable. In Turkish ruled Ibrail on the Danube, the hotel was one of the worst places in his experience. Not only was its filth indescribable, but it charged twice the price of good hotels in western Europe. The cabin on the Danube steamboat was much more satisfactory. If local hotels were adequate, O’Brien preferred them to private invitations from local supporters. Riding through Victoria, Australia, Irish hoteliers had refused payment from O’Brien and even provided free forage for his horses. Normally O’Brien avoided hotels on the Continent frequented by the English, especially in France. At such accommodation the traveller might never hear a word of French and never learn anything of ‘the genius and character of the French people’. William, on the other hand, always sought a position enabling him ‘to converse with the natives of the country through which I wander.’ He broke this rule by staying at the Hotel Maurice in Paris in November 1856, when hoping for news of his free pardon, and at the Hotel d’Etrangers in Athens. The Baedeker and Murray guide books suggested routes for travellers, means of travel and timetables. O’Brien, who strongly supported the extension of railways in Ireland, profited greatly from their faster progress. But the public diligence or other more primitive means of travel were still necessary to reach some places of interest. In Madras 1854 he travelled in a transit carriage in which ‘the traveller stretches himself at full length. They are therefore more suited to one who like me loves a recumbent attitude than an English Postchaise.’ In Cairo shortly afterwards he took in the sights from a donkey accompanied by a ‘wild Arab boy’. A mule in the Greek Island of Syros was unable to bear O’Brien’s weight and fell twice. Visiting the Escorial Palace of Philip II of Spain in 1860, want of alternative transport forced O’Brien into a ‘covered cart or small wagon drawn by two mules. A couple of beds being thrown into this wagon a very comfortable seat was provided for us, and as we proceeded at a slow pace we did not suffer much from the absence of springs.’ O’Brien prided himself on his walking and once climbed a mountain on foot when his companion preferred a horse. Unfortunately, comfortable walks required even surfaces. At Smyrna in 1863 the streets were narrow and the pavement so badly levelled with projecting sharp stones that they forced the traveller to deny Virgil’s dictum that man is specially privileged to look upwards. Safety required eyes firmly on the ground. Istanbul, O’Brien thought, was almost as bad with streets narrow and filthy. In Bucharest the streets ‘tortured’ the traveller. If railways were O’Brien’s preferred mode of travel, they had some disadvantages. The diligence had its own culture. Travelling to Granada in 1860, O’Brien and his son were trapped in one in which a Spaniard and a German, ignorant of each other’s languages, almost came to blows over cigar smoke and closed windows. In transit from Bucharest to Temesvar in 1863, O’Brien was crammed into a diligence’s compartment with a mother, four children, a servant and another passenger. He endured eight hours without food when the vehicle lost a wheel. Only his liking for children mitigated the disaster. Wheel loss on uneven surfaces was a persistent hazard in mid-19th century Europe. The conveyance of the passengers and of their luggage from the vessel to the shore, from the shore to the custom house, from the custom house to the hotel appears to have been arranged in such a manner as should place the traveller in hopeless dependence upon extortioners who surround him upon these occasions. It is better however to bear with good humour these incidents of travel than to lose one’s temper. Look after your luggage with vigilance, and all will come right in the end. Nay if you be a philosopher you will discover more to amuse you in such scenes than you could find in a play at the theatre. If extortion proceeds beyond all endurable limits call the claimant a robber and pay him half what he demands but in general it is better to submit to exaction than to engage in controversy about a few shillings. The stranger in every land pays the penalty of ignorance and in no country in Europe are the exactions levied upon foreigners more excessive than they are in England. Another source of financial loss for the tourist lay in the casinos which lurked in many popular resorts. But William, who had learned the futility of gambling at Cambridge, was not tempted to hazard a five frank piece while watching the dour gamblers at Baden. At Spa in Belgium, he supported, tongue in cheek, ‘the splendid gaming house’ which provided ‘factitious excitement’ for the idle rich and transferred their money to government coffers. In Naples, however, he questioned the government lotteries which had instilled a gambling passion into the local people without providing for their welfare. Governments encouraging gambling irritated O’Brien less than their security systems. In the mid-19th century frontier security was in its infancy, but O’Brien regarded the constant demand for visas as an abuse. Not only were they expensive, but he often used to find, as in leaving Sicily, ‘that some formality has been omitted that was indispensable.’ Moving from Cracow to Russian Poland in 1863, he discovered that there was no Russian consul at Cracow and had to wait a week till a visa could be obtained from Vienna. In some places, such as the Franco-Spanish frontier, there were no formalities. Often, especially in Italy, customs officials had to be bribed to let visitors through without an intensive search of their baggage likely to upset their travel plans. Sometimes the security took the form of confiscating newspapers and books. Here the Papal States vied with Russian authorities in imposing such authoritarian checks on unsuspecting travellers. Perhaps even more frequently than today, the 19th century traveller faced the likelihood of serious accident. In O’Brien’s case he came close to disaster when his train, diverted to the wrong line near Paris, crashed into a wall. In the Ionian Sea his steamship was caught in a potentially fatal storm. Boarding the steamer from Scio to Smyrna, the tender (a small row boat) caught in the paddle wheel of the steamer and O’Brien’s precious portmanteau was pitched into the water, but fortunately recovered. Diligences, as mentioned, could lose their wheels and draught animals could falter. A horse drawing a rustic light four-wheeled vehicle in Slovak territory collapsed, leaving O’Brien, without a word of the language, alone for many hours. Touring Greece on horseback O’Brien became so sore he had to take a few days rest and missed seeing Sparta. In Italy and Greece the traveller was threatened by brigands, but O’Brien, free from such attentions, considered corrupt customs’ officers to be the real robbers. Despite all these problems and irritations, O’Brien never gave up foreign travel. Today motor coach tours set a cracking pace with stopovers rarely more than a day or two and requiring the constant repacking of baggage for early morning starts. But O’Brien could travel for several months with very short stops at leading towns. Only occasionally did he admit that he was tired of constant travel and needed a rest. Such relaxation occurred at a Greek friend’s house. The rest proved a busman’s holiday as O’Brien used his time to detail the produce, irrigation, interest payments, education, and frequent holidays for wine, dancing and song on the island. Then he was off again through Turkey, Transylvania, Austria, Poland and Germany before returning home. The travels of William Smith O’Brien, show something of what was possible for tourists in the middle of the 19th century. In the age of huge cruise ships and jumbo jets it is surprising how many of the issues raised by O’Brien are still relevant. Large accumulations of tourists at iconic spots make it difficult for sensitive individuals to obtain ‘exotic experience’ to intensify their self-awareness. Modern security is much more intrusive than it was in O’Brien’s day, but often no more rational. His suggestion that intense anger should be feigned to overawe local authorities would probably earn a gaol sentence today. The question of guide book versus tour director is still a matter for debate. In the 1850s and 1860’s O’Brien subjected himself to as rapid changes of place as a modern coach tour requires of its customers. But the tourist bus racing along bypass highways evades historical centres which the old diligence would necessarily have entered. Fewer officials are open to direct bribery but separating the tourist from his or her money has become an art form. There was nothing in O’Brien’s day quite equivalent to the cruise ship catering for 2000 passengers. Indeed when in 1860 O’Brien visited Isambard Kingdom Brunel‘s Great Eastern capable of carrying such a number, he pronounced it certain to fail as 2000 people would never wish to travel to a particular place at the same time. He was correct in predicting the Great Eastern’s failure, but did not realise that in the future 2000 people per ship would cruise for pure enjoyment. At the back of O’Brien’s mind was the assumption that travel must have a definite purpose. To him it lay in his meticulously maintained journals, intended to demonstrate different cultures and new ideas to his countrymen. Historian G.M. Trevelyan claimed that foreign travel is of value according to the amount of historical knowledge visitors bring with them to new scenes. Smith O’Brien would have agreed. Richard is Professor Emeritus at University of Tasmania. He is the author of a forthcoming book on Smith O’Brien’s travel-writing, Travels of William Smith O’Brien in Europe and the Wider World, which will be reviewed soon in Tinteán, and of which this essay is a foretaste. O’Brien Smith seems to have missed out on the Arctic Circle.